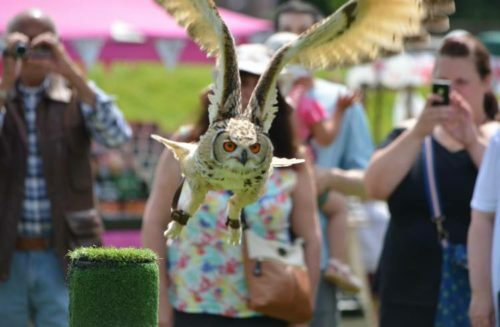 Falconry displays are an excellent addition to your show programme. These demonstrations with birds of prey are accompanied with excellent commentary that is entertaining, educational and informative. Falconry suffered a set back with the invention of gunpowder. It was a lot easier to look after a gun than a bird of prey and the gun provided more food. It was still practised by some gentry and according to a published list in 15th Century a different species of raptor was assigned to different ranks in society. The sport of hunting with falcons and hawks is believed to date back at least 2,000 years and to have originated in the Far East. As world trade grew, So Did the development of Falconry where it quickly became a popular pastime of royals and aristocrats, and for many people. It developed a status symbol that promoted there importance in society. Still to this day in some country’s its still a way of putting fresh meat onto the table and feeding family’s…. Today it is hugely popular with people of all ages rediscovering the excitement and skills of working with birds of prey. A falconry display will promote and enhance your local event. Adding an historical element to your event.